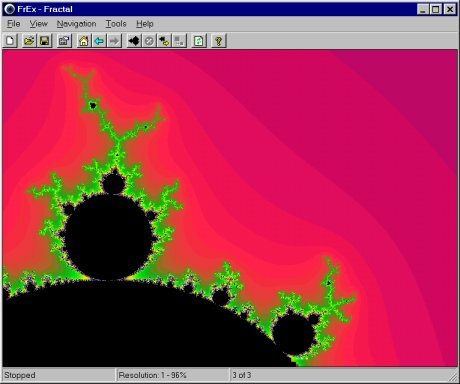 FrEx is a browser style Fractal Explorer or to be more exact a Mandelbrot Set explorer. Strictly, it should be called MSEx, but that would be silly. To magnify any area, drag a rectangle around the area of interest and select 'Generate' from the 'Tools' menu. The Mandelbrot Set is a self-replicating mathematical phenomenon which reveals itself when the mapping, z -> z2 + c, is plotted in the complex plane. In essence, take a number, multiply it by itself and add the original number. Any points that do not run away to infinity after a certain number of iterations can be said to be part of the set. Points which do run away are not, and are coloured according to the iterations taken to reach infinity. This is how a mandelbrot set image is built up. To use FrEx, however, you don't really need to know any of this. FrEx can be downloaded here. Operating systems supported are any 32-bit flavour of Windows, ie. 95/98/NT.